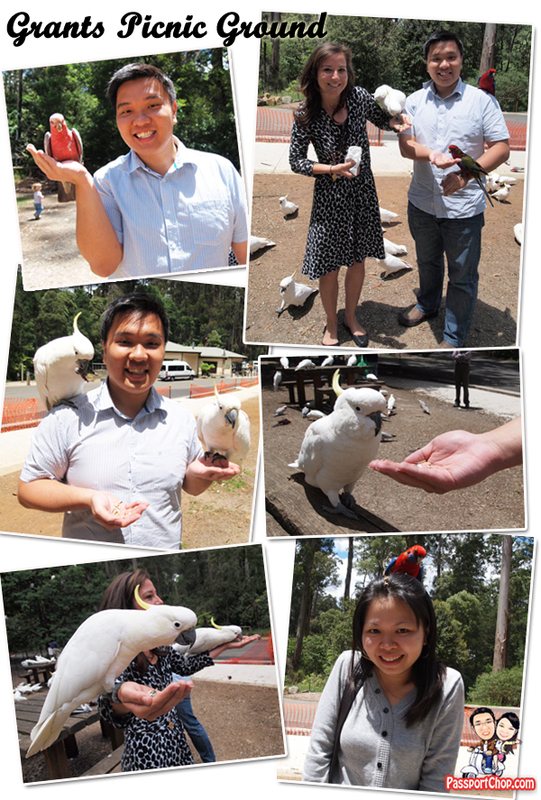 After our Puffing Billy train ride across the Dandenongs, we continued our exploration of the Dandenong Ranges with an up close and personal encounter with native Australian birds at the Grants Picnic Ground. The scenic drive through the Ranges to the Grants Picnic Ground took about 20 minutes from the Puffing Billy station of Lakeside. The Grants Picnic Ground is open from 9am til dusk everyday and this is where different species of Australian native birds gather for a picnic of their own too. Everyday, tourists (both Melburnians and from around the world) come here for a delightful (or terrifying – depends on how you feel about birds flying around you) bird-feeding experience. To start, simply drop by the Grants on Sherbrooke shop which is located conveniently by the carpark, to get a small bag of sunflower seeds for 1 Aussie dollar. If you are hungry after your bird-feeding session, you can also grab a bite at the Grants on Sherbrooke cafe. You don’t have to walk far to find the birds – just a 1-minute walk away from the shop lies some picnic benches and here the birds – we saw 3 species: Galah (the one on Zhiqiang’s right palm – see upper left picture below), Cockatoo (the large white birds which dominate the grounds) and Rosella (the one on Tingyi’s head – see picture below), will be eagerly waiting for you. You can browse in the antique stores and the local specialist shops between meals. 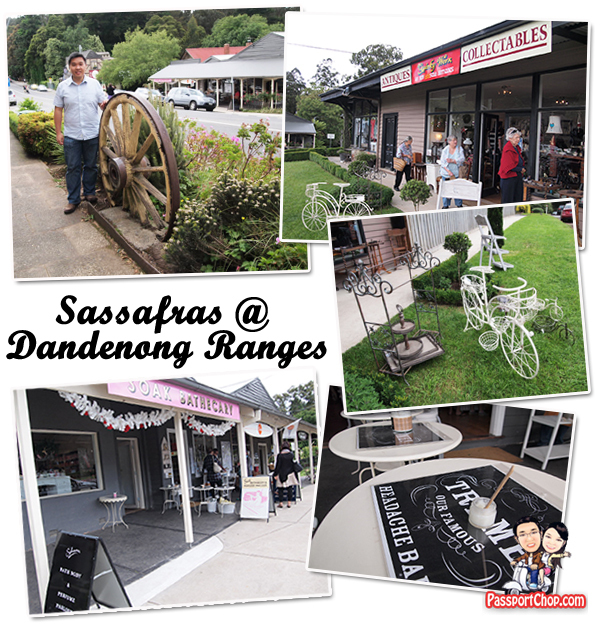 For the best local wine and produce, check out Sassafras General Store and Café, and grab a teapot souvenir from Tea Leaves which offers a range of tea accessories and of course, the tea leaves and bags itself. We even found a teapot creatively shaped like a Christmas tree and van/bus (see pictures below). 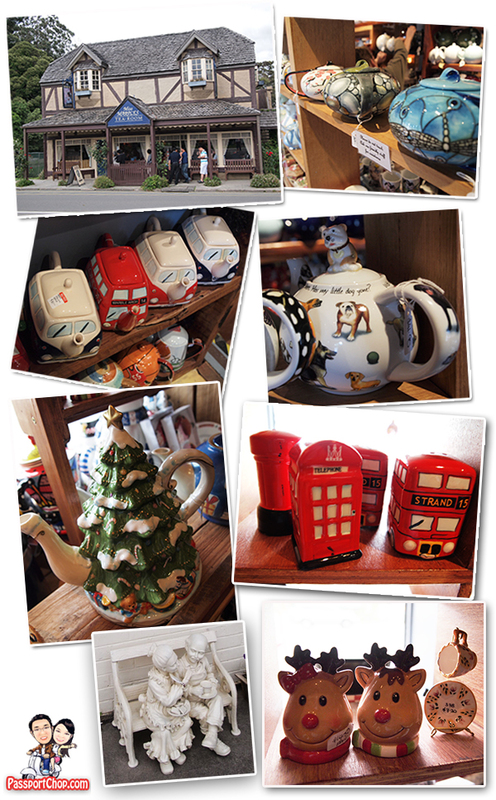 Even if you are not a fan of tea, you will enjoy browsing through the fascinating collections of the Tea Leaves shop. Sassafras is 45 minutes from Melbourne. Take the Eastern Freeway and continue onto Eastlink tollway. Exit at Burwood Highway and follow the road through Upper Ferntree Gully. Alternatively, travel east on the Monash Freeway from the city and exit at Ferntree Gully Road. Great video, Zhiqiang! Those cockatoos really love bird seed, and boss the poor little rosellas out of the way. It’s alright when they land on your arms, but when they land on your head, their claws can really dig in and hurt, cant they? Being that we’re rambling about Feeding Australian Native Birds and Exploring Old Town of Sassafras in the Dandenongs, These days there are many varieties of carriers that are even much better than conventional wicker hampers. If you are planning a nice picnic for two you will find carriers that are perfect for safely transporting a bottle of wine, glasses, and a few extra treats. Well I have spent some very frustrating days trying to get close enough to these rosellas and parrots where I was staying last year in Greensborough Melbourne to take a decent photo, as only have a digital camera. Next visit, later this year I will know where to go! Another interesting article and nice photo arrangement. How I would like my scrapbooking pages to look. Keep up the interesting articles. Oh so cute! I love parrots, been to a bird farm last year but it wasn’t what I expected. I wont mention the name of the place coz it would be unfair for them and am sure they have their reasons. But they are all caged up and I wanted to interact with them. Sadly the keeper wont allow them to leave the cage, dunno why. First of all I want to say terrific blog! I had a quick question in which I’d like to ask if you do not mind. I was interested to know how you center yourself and clear your mind prior to writing. I’ve had a tough time clearing my thoughts in getting my ideas out. I do take pleasure in writing however it just seems like the first 10 to 15 minutes are generally wasted just trying to figure out how to begin. Any ideas or tips? Appreciate it!